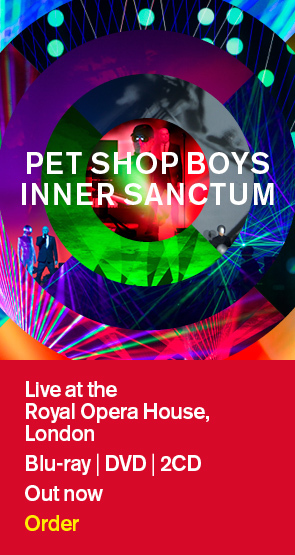 The special edition of the forthcoming Ultimate Pet Shop Boys compilation includes a DVD with over three hours of BBC TV performances by Pet Shop Boys, released by arrangement with BBC Music. As well as the complete Glastonbury Festival performance from earlier this year, there are 27 performances of singles. Here's the complete list: 1. West End girls Recorded for BBC 1’s Top Of The Pops. First transmitted: 15/12/85	2. Love comes quickly Recorded for BBC 1’s Top Of The Pops. First transmitted: 20/03/86 3. Opportunities (Let's make lots of money) Recorded for BBC 2’s Whistle Test. First transmitted: 29/04/86 4. Suburbia Recorded for BBC 1’s Top Of The Pops. First transmitted: 02/10/86 5. It’s a sin Recorded for BBC 1’s Top Of The Pops. First transmitted: 25/06/87 6. Rent Recorded for BBC 1’s Top Of The Pops. First transmitted: 22/10/87 7. Always on my mind Recorded for BBC 1’s Top Of The Pops. First transmitted: 10/12/87 8. What have I done to deserve this? Recorded for The Brits Awards. First transmitted: 08/02/88 9. Heart Recorded for BBC 1’s Wogan. First transmitted: 30/03/88 10. Domino dancing Recorded for BBC 1’s Top Of The Pops. First transmitted: 22/09/88 11. Left to my own devices Recorded for BBC 1’s Top Of The Pops. First transmitted: 01/12/88. 12. So hard Recorded for BBC 1’s Wogan. First transmitted: 28/09/90 13. Being boring Recorded for BBC 1’s Top Of The Pops. First transmitted: 29/11/90 14. Can You Forgive Her? Recorded for BBC 1’s Top Of The Pops. First transmitted: 10/06/93 15. Liberation Recorded for BBC 1’s Top Of The Pops. First transmitted: 07/04/94 16. Paninaro ‘95 Recorded for BBC 1’s Top Of The Pops. First transmitted: 03/08/95 17. Se a vida é Recorded for BBC 2’s Top Of The Pops 2. First Transmitted: 02/12/03 18. A red letter day Recorded for BBC 1’s Top Of The Pops. First transmitted: 28/03/97 19. Somewhere Recorded for BBC 1’s Top Of The Pops. First transmitted: 04/07/97 20. I don't know what you want but I can't give it any more Recorded for BBC 1’s Top Of The Pops. First transmitted: 30/07/99 21. New York City boy Recorded for BBC 1’s Top Of The Pops. First transmitted: 08/10/99 22. You only tell me you love me when you're drunk Recorded for BBC 1’s Top Of The Pops. First transmitted: 14/01/00 23. Home and dry Recorded for BBC 1’s Top Of The Pops. First transmitted: 29/03/02 24. I get along Recorded for BBC 2’s Top Of The Pops 2. First transmitted: 17/04/02 25. Miracles Recorded for BBC 1’s Top Of The Pops. First transmitted: 14/11/03 26. Flamboyant Recorded for BBC 1’s Top Of The Pops. First transmitted: 19/03/04 27. I’m with Stupid Recorded for BBC 1’s Top Of The Pops. First transmitted: 23/04/06 Both standard and special editions of Ultimate Pet Shop Boys will be released by Parlophone on November 1st.